(Oct. 22, 2018) -- The University of Texas at San Antonio (UTSA) College of Business received a $2 million grant from the Defense Intelligence Agency (DIA) as part of its Intelligence Community Centers of Academic Excellence Critical Technology Studies Program. Leveraging UTSA’s newly-established National Security Collaboration Center (NSCC), the college will engage with partners in the intelligence community including the Army Research Laboratory, the 25th Air Force and Booz Allen Hamilton. “The DIA CAE program in Critical Technology Studies was built to provide a pipeline for partners of the National Security Collaboration Center, a government-university-industry ecosystem working to rapidly develop and prototype state-of-the-art technologies and solutions for national security and global defense. This program will create students with a global understanding of intelligence collection, analysis, counterintelligence and other key aspects within intelligence studies,” said Bernard Arulanandam, interim vice president for research, economic development and knowledge enterprise at UTSA. "As an industry leader in the defense, intelligence and cyber arenas, Booz Allen Hamilton congratulates UTSA on winning an important federal grant to work toward becoming an Intelligence Community Center of Academic Excellence,” said Bob Miller, vice president and San Antonio location general manager at Booz Allen Hamilton. “This is a victory for the whole national security community in San Antonio, as it will bring additional emphasis and synergy to South Texas, by educating students and community leaders alike in the key, common issues that matter to industry, academia and government." The College of Business will also establish an academic consortium with five South Texas Universities. Consortia faculty and students will collaborate on research, participate in academic boot camps and network with local, regional and national intelligence community experts. 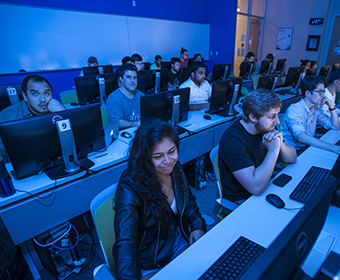 Learn more about the UTSA College of Business, its Department of Information Systems and Cyber Security and its unique Master of Science in Data Analytics program. Learn more about the university’s National Security Collaboration Center.